I absolutely love tacos–ALL tacos. I don’t care if it’s from Taco Bell or an authentic Mexican taco truck, I have no prejudices. Luckily, living in LA grants me infinite taco possibilities and plenty of $1 taco days. When I lived on the Westside, this bar near my place called Busby’s served up $1 tacos every Tuesday. My favorite was their Yukon potato taco with sour cream, tomatoes, lettuce, cheese, and salsa. So weird, but so delicious. That’s the best part about tacos–they can be so versatile. They don’t have to stick to any standard or have any boundaries. I will say, however, that my favorite tacos contain some sort of citrusy slaw and spicy crema sauce. So, when I was craving tacos the other day, that’s exactly what I went for. I didn’t have any cabbage in the fridge for the slaw, so I improvised with kale and shredded broccoli. I tossed it with soy and rice vinegar to give it an Asian flavor. I also used Sriracha and plain Greek yogurt for the crema (traditionally, a Mexican style sour cream) to keep that same flavor profile throughout. I love the fusion of Asian flavors in what is normally thought of as a Mexican dish. I encourage you all to get a little more creative on your next taco endeavor! And to all my LA friends, check out LA Magazine’s Tacopedia: A Complete Taco Encyclopedia of LA, to learn about the best tacos Los Angeles has to offer. First, make the slaw by combining all ingredients in a large bowl. Toss well and season to taste. Store in the fridge until you’re ready to build your tacos. Next, cut the chicken breast into tiny cubes and season with garlic powder, onion powder, cayenne, salt and pepper. Heat a pan over medium heat and lightly coat with olive oil. Because the chicken is so small it will cook fast, so keep an eye out. When the chicken is done, take off the heat and splash some soy sauce in the pan. Toss to coat. While the chicken is cooking, make the crema by mixing the Sriracha with the yogurt. Adjust the amount of Sriracha you use, depending on how spicy you want it. Transfer the sauce to a Ziplock bag, squeeze it all to the corner and cut the tip off. Heat a skillet over medium heat to warm the tortillas. 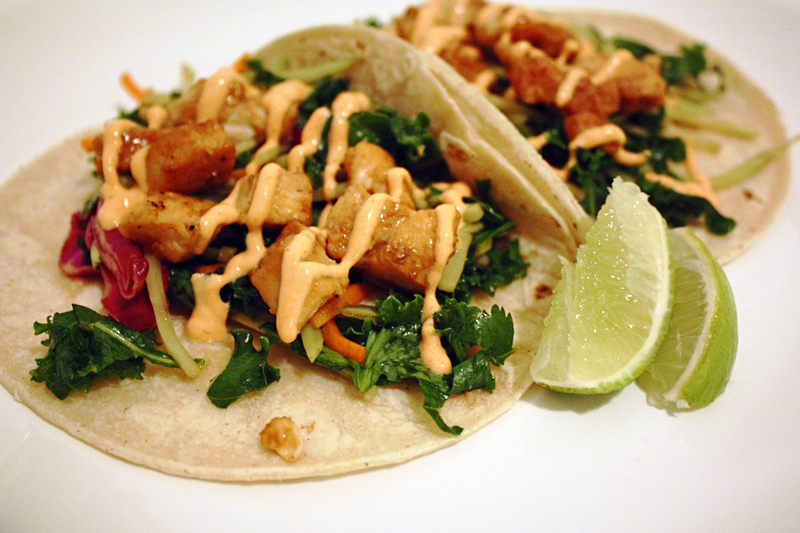 When the tortillas are ready, build your tacos by layering the slaw and then the chicken. Drizzle the crema over the top and squeeze with fresh lime juice.